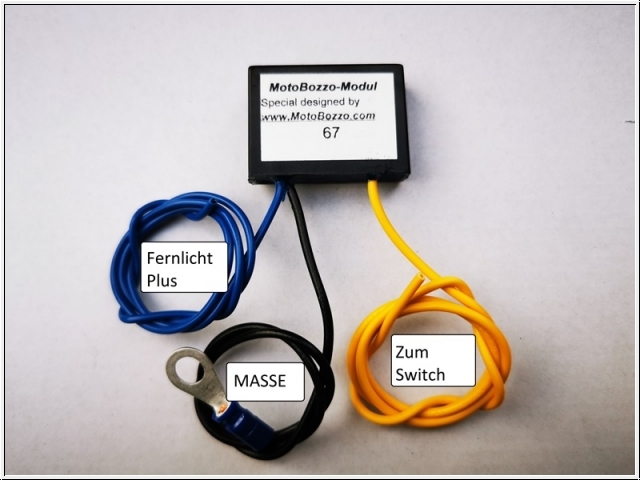 The MotoBozzo wiring harness has small electronics that eliminate the need for an additional switch for turning on / off headlights / consumers and was developed by MotoBozzo itself. The new little MotoBozzo electronics are sealed waterproof and fits all motorbikes! After switching on the ignition or starting the engine, depending on the model, the MotoBozzo-electronics automatically switch on the lamps / consumers first and automatically switch them off again when the ignition is switched off, so no further switching is necessary. On BMW models without CanBus system and separate turn signal reset button, this can also be switched on or off at any time with a double-click. For all other models, including BMW with CanBus technology, the lamps are switched by double-clicking the lighthorn/pass button, switching via turn signal reset is not possible because of the BMW-CanBus system! Again, the lights go on automatically after starting the engine or switching on the ignition! A control LED indicates the operating status of the lamps, the LED cable can be extended or shortened as desired. 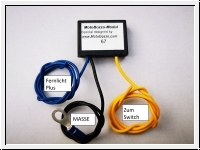 There is only one MotoBozzo switch that now fits ALL MODELS! MotoBozzo switch, relay 40 A, fuse 15 A and all cables pre-wired (see example photos). All main power cables are covered with additional protective hose! ATTENTION, NOT SUITABLE FOR BMW R 1200 GS - LC! This Product was added to our catalogue on Tuesday 19 March, 2013.